It's Election Day here in Pennsylvania - don't forget to vote!!! Here is where I am on the Marianas Pullover. 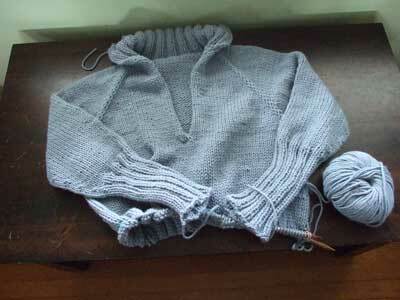 Finished collar, yoke and both sleeves - heading down the body. Coming down the home stretch. Poking around on Ravelry I came across this, which I then had to order from Nordic Fiber Arts (the source of all that is good in the world) immediately. More Selbu madness!!! It's actually in Norwegian with an English translation attached. 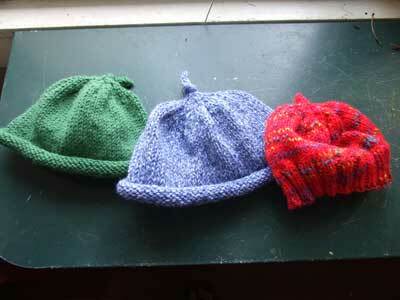 Part of me (a big part of me) wants to see if I could knit a mitten without resorting to the translation. I'll keep you posted. 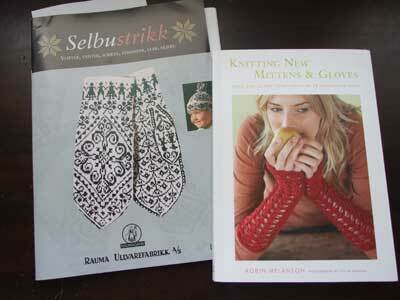 The other book is a gorgeous and worthy contribution to Mighty Momogus Mitten Madness. Doing some Knit-Along research for the Tangled Web fall season, I started the Calla Lily Bag from "The Knitter's Book of Yarn." It's designed by Cat Bordhi, who is a genius. Unfortunately, I am not a genius, and the twisty-turny directions wrestled me to the ground and had me in a headlock almost immediately. I sent a plaintive note to friend Anjeanette who has made a beautiful version of this bag. Funnily, just knowing that she would help me calmed me down and I figured out what was going on. Which was craziness. But I'm halfway through now and enjoying it rather than weeping in frustration. I'd post a picture but it's just a big red blob right now. I wasn't liking how the Phillies were playing, so I took the spring flag down and put the Phillies flag up. They immediately won two games, including last night's in which Utley hit another home run (one in each of the last five games!!) and Werth had an inside-the-park home run, which is very cool. Now I hope they continue with their winning ways for a while, so I don't have to become the Mayor of Crazytown switching flags every other day. Well, those Rockies pitchers actually got Chase Utley out three times, which is a little worrisome. All he got was a double and a home run. Do you think sometimes it might be better to leave Burrell in left field. Last night the guy they put in for him made an error, and a couple of times recently when they put Taguchi in (he's so So) he dropped fly balls he could have caught, although they called them hits. (On the other hand, maybe Pat wouldn't have gotten close enough for the balls to bounce off his glove.) Something for Charlie to think about. and i'm the one keeping secrets! that looks fab-o! i gotta take pics of salina. i'm almost done the back and i'm already halfway through the left front placket. i've got a german lace book, christine duchrow. it's fun times getting my younger bro (who knows some german) to help me out. and i seriously need your flags to stop dictating the phils' wins lol. what are they made of? do you have jedi flags or something? gg - after last night's game, I think it is prudent to never take Burrell out of any game at any time in April. jjp - [what's the "2" for? is that your evil twin?] Thinking about you getting your younger brother to translate German lace knitting instructions is HI-larious!! Can I come over and listen? ?